I love these two characters. Damon Marquis of Hawksworth has served his country in the war against Napoléon Bonaparte. Now that the fighting is over he's bored. He plays games with the young bucks of the ton but it's gotten old and boring. Meg Featherton has had really, really bad luck with the men who've come courting. Little does she know her Grandmother & Granny's friends are a matchmaking cabal. Never underestimate an old lady. They've had matchmaking success so far and are determined to put Damon and Meg together. Damon is attracted to Meg but doesn't understand her reluctance to allow him to get close to her. Que the cabal. Damon works hard to win Meg's affection and ultimately is successful. Meg has ideas for their future and they come to understand how right they are together. Two become one. Don't miss the secondary characters, they're great and you'll come to care about them too. I love it when the friends are fleshed out, it adds so much to the story. This turned out to be one of my favorite books. It's on my keep to read again list. Miss Featherton's Christmas Prince by Ella Quinn is a well written book. Meg and Damon's story is a touching tale of family and friends "helping" get a couple together. Misunderstandings, manipulations and old boyfriends give this book plenty of humor, drama and action. I love the feisty characters in Miss Featherton's Christmas Prince. I look forward to reading more from the talented Ella Quinn in the future. 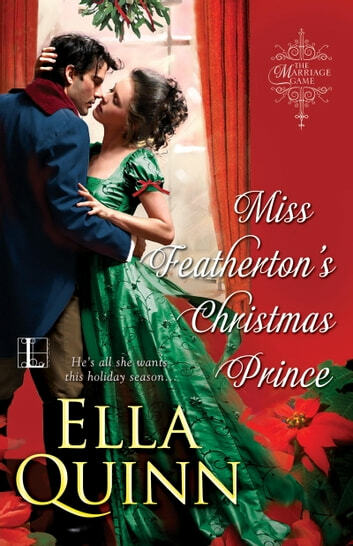 Miss Featherton's Christmas Prince is a complete story, not a cliff-hanger. I received a copy of this book from NetGalley for review purposes. What I enjoy most about reading an Ella Quinn novel is that I can picture myself in every story. Ms. Quinn writes stories that appeal to every lover of romantic fantasy. With a stroke of the pen I was taken back in time to an era of matchmaking and romance with dashing gentlemen and graceful women. The simplicity of that time is what appeals to me the most. I received an ARC of Miss Featherton's Christmas Prince through NetGalley and Kensington. Meg and Damon's story plays out like a fairytale with the attraction and subterfuge that entails.